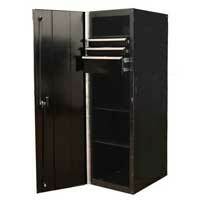 CRX72251901SET Combo Set includes a 19 drawer 72" rolling tool cabinet and a 72" top tool hutch. MAG Wheel Upgrade for RX and CRX Series Tool Cabinets. Set of 6 2 rigid and 4 swivel / locking wheels, all with grease fittings. Solid one piece wheels. 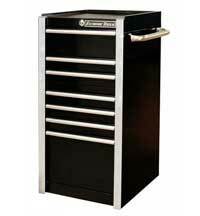 This 72" 3 bank tool cabinet with wheels includes 19 drawers, and was developed to handle all types of heavy duty activities while working on garage projects. *** RollCabs.com CRX722519RC is built by Extreme Tools and carries the same warranty as all RX Series tool boxes. All drawer slides in the CRX722519RC are rated @ 150 lbs per pair rather than standard 100 lbs per pair found on the Extreme RX722519RC. Load Capacity: 150 lbs. for each set of ball bearing glides, double glide drawers 300 lbs. "Just unboxed my new toolbox! Wow it is so nice I wasn’t sure what to expect since I’ve never seen anyone with this brand. But if your in the market for a new box this is 3x the box for the money compared to anything else. Very impressed. They are very close to and in some ways they are rated better than Snap On. And 1/4 the price. They have the best prices trust me I researched for about a month. And free shipping!!!" Rollcabs.com complete tool storage product line is strictly manufactured by Extreme Tools. The RX Series, made by Extreme Tools, has been modified by us, with improvements and upgrades, and is called the R-CRX Series on this website. The following list of improvements are reflected in the R-CRX Series. All boxes with the R-CRX prefix are labeled RollCabs.com and follow the same warranty as Extreme Tools products. On this R-CRX tool box, the load capacity is 150 lbs. for each set of ball bearing glides, double glide drawers 300 lbs. R-CRX series roll cabinets include new, thick protective work panel in place of foam pad. All R-CRX toolboxes are not only reduced in price but have added benefits compared to the RX Series Extreme Tools' tool boxes!